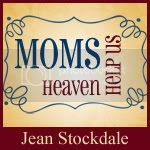 Jean Stockdale... : It Really is All About Jesus...but This Part is ALL ABOUT ME! It Really is All About Jesus...but This Part is ALL ABOUT ME! Standing Near the Cross Inc.
A nonprofit organization committed to making Jesus known and instructing women, especially moms, how to rightly divide the Word of God. I am a wife to Craig Stockdale and the mom of Jason and Dawson. Craig and I have bee extremely blessed to have raised and released 2 wonderful sons into the adult world. We have been blessed to see both boys marry and now have sons of their own. 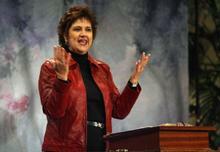 I have been writing and teaching a weekly Bible study to nearly 300 moms for the last 20 years. In 2006, I began to publish my studies and produce accompanying CDs and DVDs. My interactive Bible studies can be done by an individual or in small groups. The addition of her DVDs allow small groups or churches to create a ministry to moms. Nearly 30 churches are using my studies to create their own ministry to moms. Spending time with my husband, Craig, our family and friends, studying the Word of God, writing Bible studies for moms, teaching weekly Bible studies for moms, speaking at Women's Conferences and retreats consumes my time, but my love for the Lord Jesus Christ and a desire to advance the kingdom of God consumes my heart.